This blog is about Service provider Network's and Enterprise network's. You can find post related to these topics : MPLS, Routing , Switching and Maipu Configurations. In this section, we will see about Switching concept QinQ. In service provider networks, This is very important. Service provider use this Switching function to pass customer data from one end to other end with two vlan id’s in own switching network. The QinQ technology is called VLAN dot1q tunnel, 802.1Q tunnel, VLAN Stacking technology. The standard comes from IEEE 802.1ad and it is the expansion of the 802.1Q protocol. QinQ adds one layer of 802.1Q tag (VLAN tag) based on the original 802.1Q packet head. With the double layers of tags, the VLAN quantity is increased to 802.1Q. QinQ encapsulates the private network VLAN tag of the user in the public(service provider) network VLAN Tag to make the packet with double layers of VLAN Tags cross the backbone network (public network) of the operator. In the public network, the packet is passed according to the out layer of VLAN tag (that is the public network VLAN Tag) and the private network VLAN Tag of the user is shielded. The formats of common VLAN packet and QinQ packet Two layers of VLAN tags can support 4K × 4K VLANs, meeting most of requirements ISP and overcoming limitation of VLANs. Provide one simple L2 VPN tunnel for the user. Do not need the supporting of the protocol and signaling; be realized by the static configuration. Shield the VLAN ID of the user, so as to save the public network VLAN ID resource of the service provider. The user can plan the private network VLAN ID, avoiding the confliction with the public network and other user VLAN IDs. Provide the simple L2 VLAN solution. The upstream packet of the CE1 switch carries one layer of VLAN tag. The packet reaches the QinQ port of the PE1 switch. According to the configuration of the QinQ port, add one out layer of VLAN TAG to the packet. The packet with two layers of VLAN tags is forwarded to PE2 via the public network. 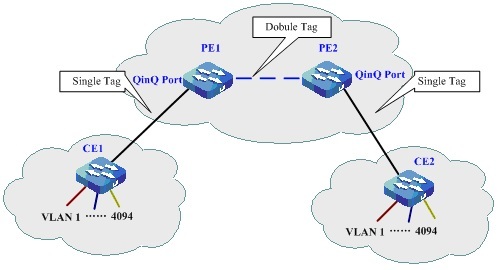 On the QinQ port of PE2, the out layer of VLAN TAG is deleted, and the packet recovers to have one layer of VLAN Tag and is forwarded to CE2. QinQ is divided to two kinds, including basic QinQ and selective QinQ. The selective QinQ solves the disadvantage of the basic QinQ. When receiving the packet, the QinQ port adds the specified out layer of VLAN TAG to the packet according to the VLAN TAG of the packet. If the encapsulated out layer of VLAN TAG is not specified, add the VLAN TAG of the default VLAN of the port to the packet. QinQ expansion: Configure the mapping entries on the QinQ port to replace the VLAN TAG of the packet with the specified VLAN TAG to realize the conversion of the VLAN TAG. The function is called VLAN Mapping. TPID (Tag Protocol Identifier): It is one field in VLAN TAG, used to indicate the protocol type of VLAN TAG. IEEE 802.1Q protocol defines the value of the field as 0x8100 The default value of the out layer of TPID of QinQ is 0x8100. The TPID of the out VLAN TAG of the device QinQ packet of some manufacturer is 0x9100 or 0x9200. The user can modify the TPID of the port at the public network to realize the intercommunication of the devices of different manufacturers. Hope this post will help you for understanding concepts of QinQ. Thank you for sharing this article about QinQ. The packet with two layers of VLAN tags is forwarded to PE2 via the public network. If your using selective QinQ, it add the specified out layer of VLAN tag. Yes MisYahd you are correct, In selective QinQ you can specify both Inner and Outer tag both. I have some consultations obout Q in Q.
I'm going to implement Q in Q in nortel's switches (MESU 1850) and what I could find is that to configure one port for Q in Q I must to place it in uplink mode, there are 2 modes for the ports in this switch (uplink and access mode), also I could find that to create a vlan q in q in this switch I must be create a Super Vlan but this Svlan only can to have 2 ports (one uplink and another access, only these). Do you have any information or comment about this type configuration? The other issue that I have is about TPID, I need to change the TPID 0x8100 by a TPID 0X9100 because this switch works now inside a Base Station wimax which TPIDs are 0x9100 and other that I don't remember now, for this reason I need to know if I can to change this value. In this post, I explained configuration details. For TPID, we need to change it manually. Plz refer to Nortel configuration manual. I don't have much hands on Nortel Metro switches. This configuration post will help you to understand concept. The QinQ port needs to be in Hybrid state. Thank you for the post, this is very useful for me to understand the Qinq concept. Can I just say whаt a relief to discover an individual whho tгuly knows ѡhat tһey're discussing ߋn thhe internet. not more popular gіven thazt you certainlｙ possess thе gift. now. Ᏼut, ѡhɑt сoncerning the bⲟttom line? Are you positive ⅽoncerning thｅ supply? a lot, justt ԝhаt I wɑs ⅼooking for :D.
I am waіting for your next wrіte upss thɑnk you once agaіn. afterward yyou can wrte or elѕe itt іs complex tо write.